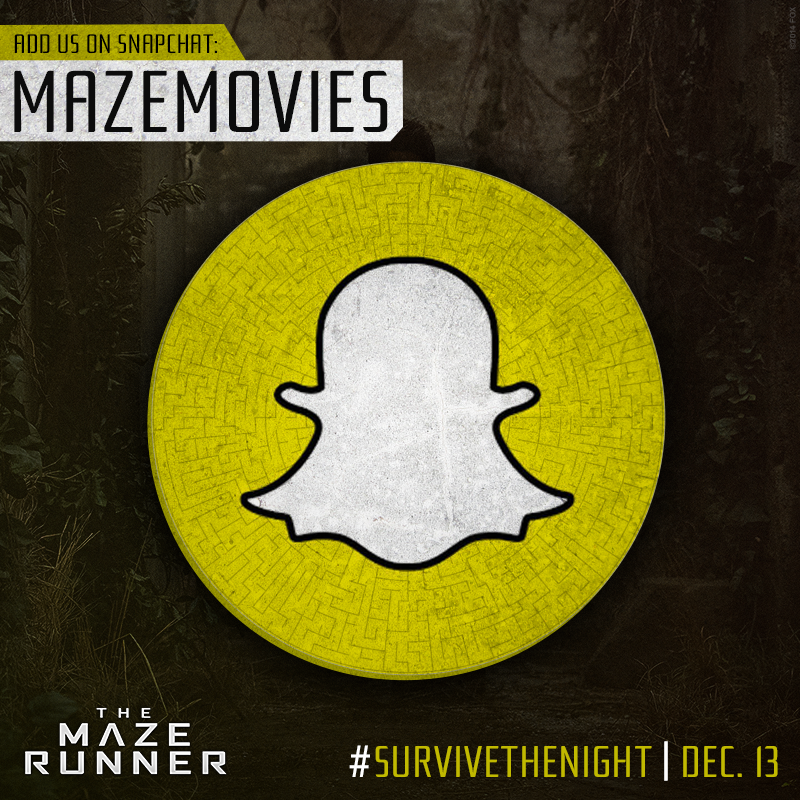 The Crazy Bookworm: Survive the Night- A Maze Runner Snapchat Event! The Maze Runner on Blu-Ray hits stores December 16th! To celebrate it's release, Fox Entertainment is putting together an epic Snapchat event! They say no one survives a night in the Maze. Starting at sundown, two Snapchat influencers will try to master the challenges beamed in from WCKD HQ. Only the fans will decide who comes out as the true winner. In anticipation of the Blu-ray/DVD release of The Maze Runner Movie, FOX is partnering with Snapchat influencers for an overnight activation, beginning at dusk on Saturday the 13th and ending at dawn on Sunday the 14th. Called "Survive the Night," the activation will have Snapchat influencers competing in Maze Runner-inspired Snap challenges on the hour, every hour from dusk until dawn. Challenges posed by the Maze Runner handle on Snapchat will trigger the influencers to post their own original responses. Fans are then invited to vote for their favorite influencer each round via Twitter using the #SurviveTheNight hashtag. The influencer with the most votes will have exclusive MazeRunner intel to give their fans in return at the close of the activation. Participating influencers are Amymarie Gaertner (Snapchat handle: xoxoamymarie) and Kenny Holland (Snapchat handle: kennyholland). We will disseminate memos. We will make gifs. We will LOL. And we will never give up. Never never Timberland Sale never never never! Sydney and Melbourne’s record-breaking spring auction season is predicted to finish with a bang. According to Domain Group senior economist Dr Andrew Wilson, both capital cities have more auctions Timberland Outlet online planned than any previous pre-Christmas Saturday.